We collected the webcams of Aruba and put them on one page. 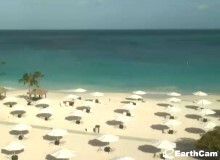 No need to look further to find other webcams on Aruba. If you miss a webcam, please contact us. Cam is active 24 hours! Aruba is a 19 miles (30 km)- long island of the Lesser Antilles in the southern Caribbean Sea. It's a mere 15 miles (24 km) from the coast of Venezuela. On a clear day the Venezuelan mainland is visible from the south-eastern coast. Together with Bonaire and Curaçao, it forms a group referred to as the ABC islands of the Leeward Antilles, the southern island chain of the Lesser Antilles.